We’re recently back from launching Soak in the UK at the Craft Stitch and Hobby show. The launch was amazing- over 15 editorial pick-ups as well as signing on new stockists. Here’s a sneak peak of our set-up with our new distributor EQS. We’ve also started the sample program in the UK, (Sample program: Are you a Soak retailer having an event or in-store promotion? 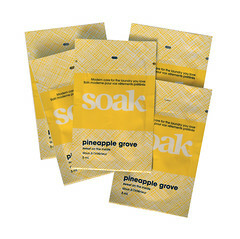 We’ll happily send free mini-soak treats for your event, to launch and promote Soak to your customers. 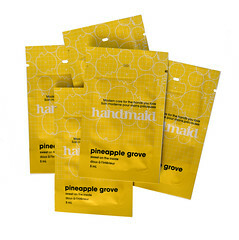 If you’re a guild/ stitch club member we can send you treats too, just tell us who your favourite shops are. Just ask!) so our stores there can introduce Soak in the same exceptional fashion we do on this side of the ocean. I was given a couple of free samples by Bromley Sewing Machine shop. I have since bought some bottles as it is wonderful stuff! I have used it to wash a delicate jacket, armchair covers and a hat – all not supposed to be washed but it is so gentle it was ok – all lovely and clean without the expense of dry cleaning! No shrinkage, colour loss or damage to the fabrics. I will definitely be recommending it to friends! Thank you.